Dan Wright has been in search of the perfect wave since he first waxed a board. He’s also been in search of the perfect beer. He couldn’t control the waves. But he could have a tackle at the beer side of things. Being a brewer, after all. Swell Brewing Co. is the result. Originally brewed in the back shed of he and his winemaker wife Corrina’s vineyard in McLaren Vale, the beer is “quite a good drop” says Dan. Two beers – a pale ale and a golden ale. Preservative and artificial additive free. 500ml bottles. It is, Dan says, “the boardriders beer”. The pale ale is in the style of American Pale Ale, full flavoured, with a generously bitter finish. Floral and citrus aromas combine with a complex malty backbone. The golden ale is lighter in style, and is perfect as an easy drinking beer with its moderate bitterness and maltiness. RRP $25 per 4 pack. TONIGHT 5-8.30pm. South West Corner of the market (near Zuma). 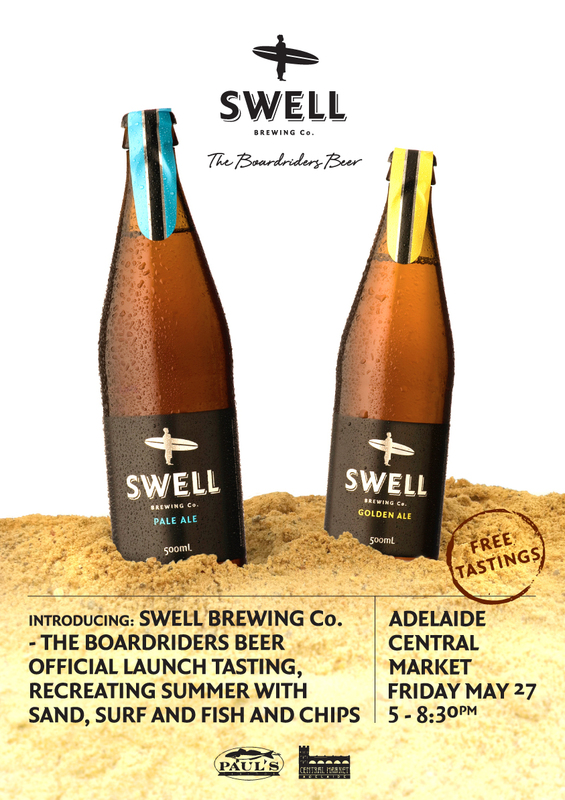 Free tastings and Swell beer battered fish’n’chips from Paul’s Seafood on Gouger. Enter your email address to subscribe to this blog and receive notifications of new posts by the Kooki team by email.